An ear consists of far more than the part that we see on the side of our head. It contains three sections—the outer ear (pinna, ear canal, and eardrum), the middle ear, and the inner ear. The pinna collects sound vibrations and directs them along the ear canal to the eardrum. When the eardrum vibrates, it causes the tiny bones in the middle ear to vibrate as well. The bones transmit the vibrations to the cochlea in the inner ear. The cochlea then sends nerve impulses to the brain, enabling us to hear. The eustachian tube links the middle ear to the back of the nose. The main function of the tube is to ensure that the air pressure in the middle ear is the same as the pressure in the outer ear and the surrounding atmosphere. It does this by transporting air from the upper throat into the ear. The tube also drains mucus and fluid from the ear. Unfortunately, a eustachian tube can sometimes become blocked and incapable of transporting substances. As a result, the pressure on the outer ear side of the eardrum may be higher than the pressure on the inner side, causing the sensation of a plugged ear. In addition, mucus and fluid may collect in the middle ear. 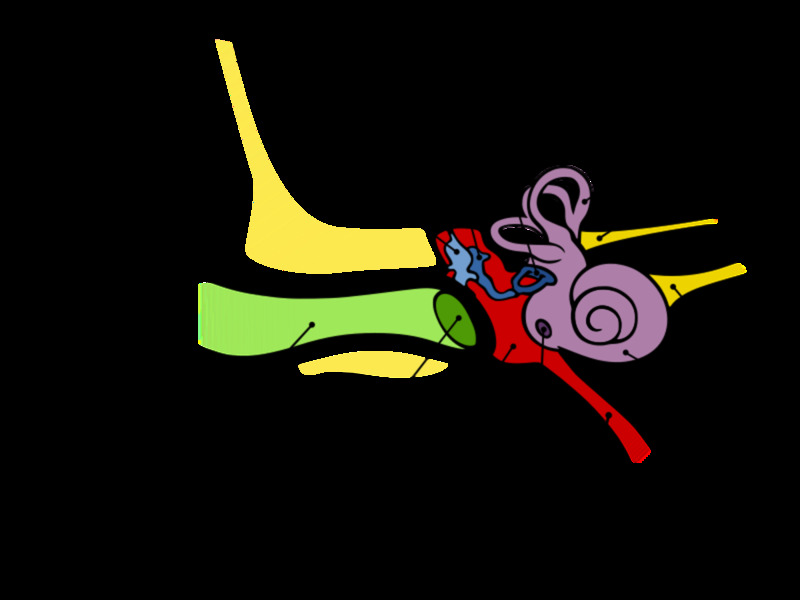 The pinna, ear canal, and eardrum all belong to the outer ear, even though only the pinna is outside the body. 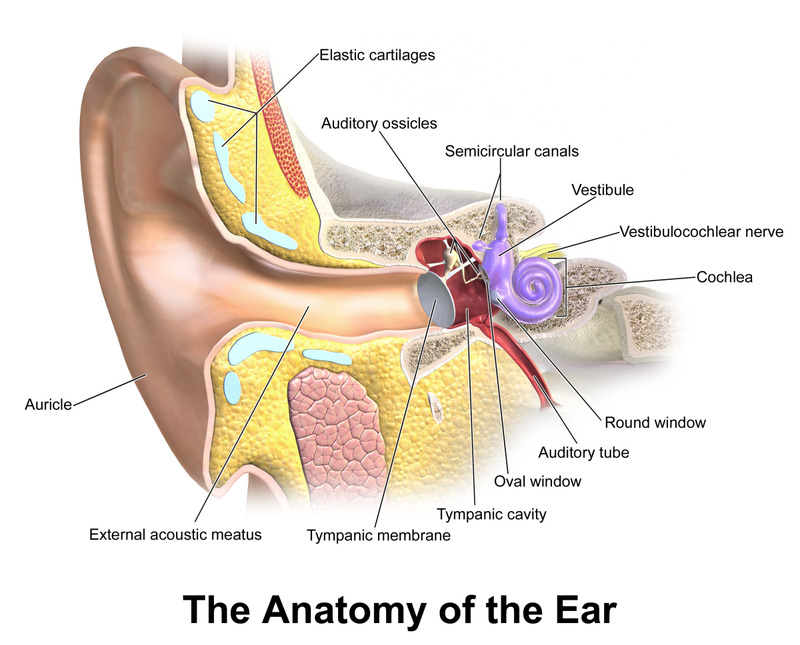 The outer ear is made of the pinna or auricle (the part of the ear that we can see), the ear canal, which is also called the external auditory canal, and the eardrum or tympanic membrane. The middle ear is filled with air. It contains three tiny bones which are known as ossicles and are attached to each other. These bones are the malleus or hammer, the incus or anvil, and the stapes or stirrup. The stapes is the smallest bone in the human body. It's also known as the stirrup because it looks like the stirrup in which horse riders place their feet. 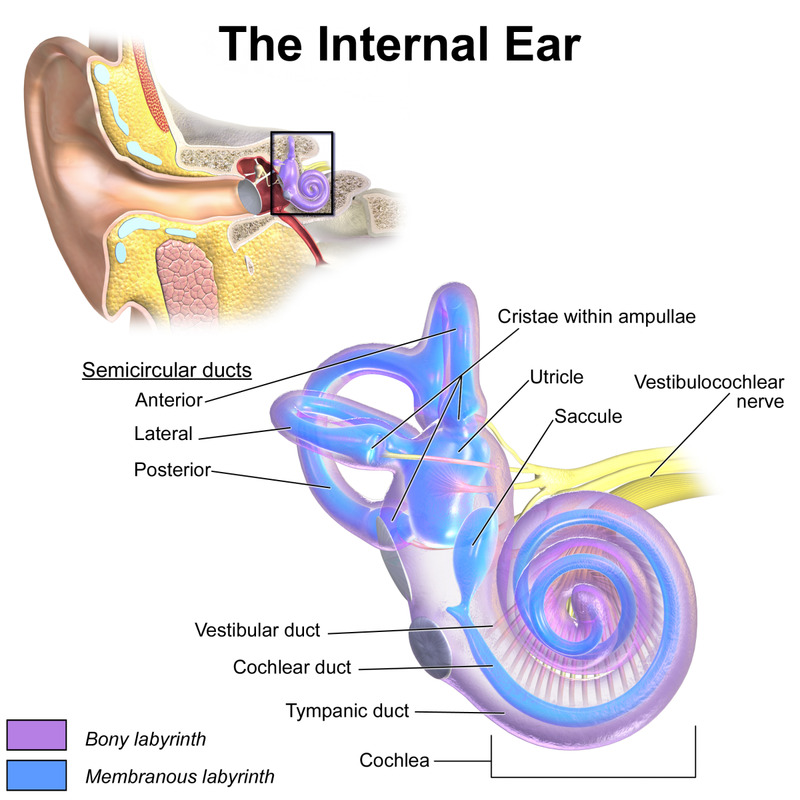 The inner ear is filled with fluid and contains the cochlea, which is vital for hearing, and the semicircular canals, which are vital for balance. The inner ear, the middle ear, and the ear canal are located in a cavity in the skull. The vestibular nerve leaves the semicircular canals and the cochlear or auditory nerve leaves the cochlea to carry information from the ear to the brain. The two nerves join to form the vestibulocochlear nerve. 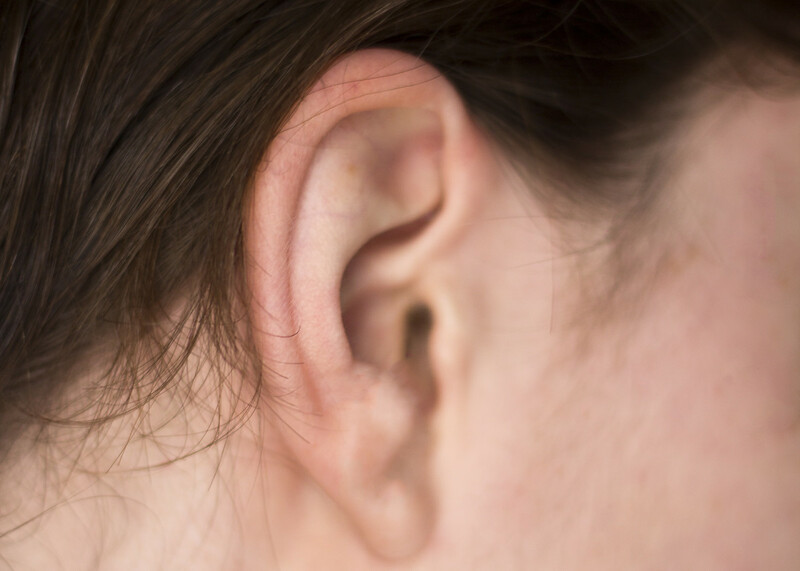 In order for us to hear, sound vibrations must first travel through the ear canal and then through the tympanic membrane (or eardrum) to the malleus. The malleus transmits the vibrations to the incus and stapes. The three ossicles amplify the sound vibrations, making them about twenty times stronger than they were when they entered the ear. The footplate of the stapes is attached to the oval window, which is covered by membrane and leads to the vestible of the inner ear. The vibration of the stapes against the oval window causes the window and the fluid in the vestible to vibrate as well. The vibrations are then passed to the fluid inside the cochlea, where they stimulate hair cells. The cells are known as "hair cells" because they have hair-like extensions. They perform a very important job that is essential for hearing. Hair cells convert the mechanical stimulation of vibrations into the electrochemical signals of nerve impulses. The nerve impulses travel along the auditory nerve to the brain. The brain then creates the sensation of sound. Eutaschian is pronounced you-STAY-she-un. Most of the time our Eustachian tubes are closed. When we swallow or yawn, we often hear a clicking sound in our ears. This is produced by the tubes opening up and then closing again. The eustachian tube is about 3 to 4 cm long in adults (around 1.2 to 1.6 inches) and is a little shorter in children. It slopes downwards from the middle ear to the nasopharynx, which is the upper part of the throat behind the nose. The middle ear contains air. The air is constantly being absorbed by the lining of the middle ear, reducing the pressure. Air pressure needs to be the same on each side of the eardrum in order for the eardrum and ossicles to vibrate properly. When a eustachian tube is open, air passes from the back of the nose or throat through the tube to the middle ear, returning the pressure to normal and allowing the eardrum to function normally. The tube also transfers any fluids that build up away from the middle ear. Children are more likely to develop blocked eustachian tubes than adults. Their tubes are shorter and narrower than those of adults and are also more horizontal, making it harder for fluid to drain out of a eustachian tube into the throat. These factors make it more likely that bacteria and other microbes will collect and multiply inside the tubes. In addition, children have less developed immune systems than adults, making it harder for their bodies to attack bacteria, fungi, and viruses. The eustachian tubes are named after Bartolomeo Eustachio, a sixteenth century Italian anatomist who was the first person to describe the tubes correctly. The information about problems in the tubes given below is intended for general interest. A doctor should be consulted if problems are severe or persistent. Eustachian tube dysfunction refers to a condition in which a eustachian tube is blocked, fails to open, or fails to close. If the tube is blocked or doesn't open, the pressure on the outside of the eardrum becomes higher than the pressure on the inside, causing the eardrum to bulge into the middle ear. This process is known as ear barotrauma. Barotrauma is often minor and temporary, but if it's severe or prolonged it may damage the eardrum, reduce the ability to hear, and cause pain. Any time the pressure is different on each side of the eardrum a person may feel a fullness in their ears, as though the ears are plugged or clogged. Hearing is often muffled because the eardrum can't vibrate normally. The ears may be painful. There may also be a ringing sound in the ears (tinnitus) or a popping sound. The sense of balance may be affected as well. A patulous eustachian tube is one that stays open. The condition causes a person to hear normally inaudible sounds created by processes in his or her own body, such as breathing and the heartbeat. In addition, their own voice sounds louder than normal. These effects appear because vibrations in the body travel through the open eustachian tube and strike the eardrum directly. A mucous membrane lines the insides of the eustachian tubes, the middle ear, the sinuses, the nose, and the throat. The membrane produces mucus, which is a thick, lubricating, and protective liquid. A respiratory infection such as a cold or the flu may cause mucous membranes in the area to become inflamed. Symptoms of this inflammation may include swelling of the membranes and excessive mucus production. Swelling and mucus collection in the eustachian tube can block the passage of air. The mucus may form inside the tube or enter it from another area. A blocked eustachian tube may be unable to open on its own. The condition may be temporary. It often lasts for a week or more after the respiratory infection has been cured, however, since it takes time for the mucus to leave the tube and any swelling to disappear. Any allergic response which causes symptoms in the nose, such as hay fever, can also affect the eustachian tube. 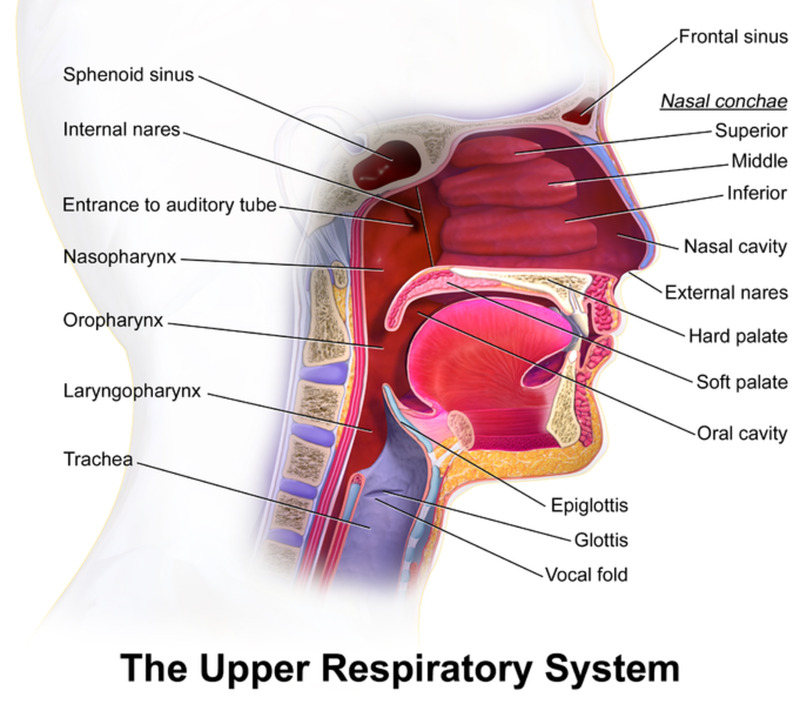 As in a respiratory infection, inflammation may develop inside the tube and/or in areas around it, accompanied by swelling and increased mucus production. The lining of the middle ear and eustachian tubes is covered with cilia, tiny hair-like cell extensions that move and create a current of mucus. Smoking can damage the cilia, preventing fluid from being drained from the middle ear. Prolonged and repeated exposure to secondhand smoke can have the same effect. Changing elevation rapidly can alter air pressure in the outer ear. This can cause a plugged ear sensation until the eustachian tube and the lining of the middle ear compensate for the pressure difference between the outer and middle ear. Airplane flights, scuba diving, and driving up or down mountains can all caused plugged ears. If we descend rapidly from a high elevation plane flight, for example, the air pressure in the outer ear becomes temporarily higher than the pressure in the middle ear. The eustachian tubes may be closed due to the presence of swollen areas nearby, such as enlarged adenoids. The adenoids are clumps of spongy tissue in the nasopharynx near the openings of the tubes. They are largest in young children and shrink with age. Their function is to help fight infection. If they become enlarged they may close the eustachian tubes. Injuries that damage the eustachian tube and malformation of the tube can also cause ETD. 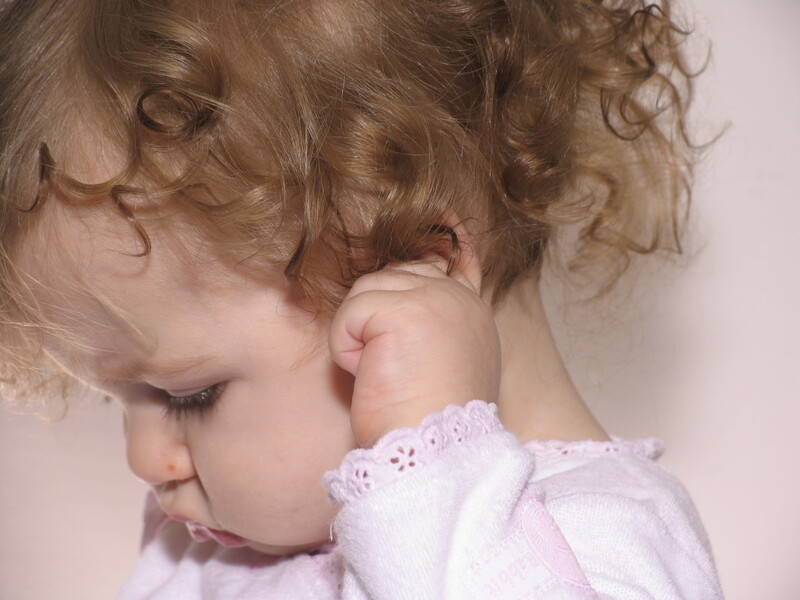 Otitis media is a middle ear infection and inflammation that is very common in young children. It's much less common in older children and adults, although it does occur in these age groups. In otitis media, fluid collects in the middle ear. The fluid pushes on the eardrum, causing an earache and preventing the eardrum from vibrating properly. 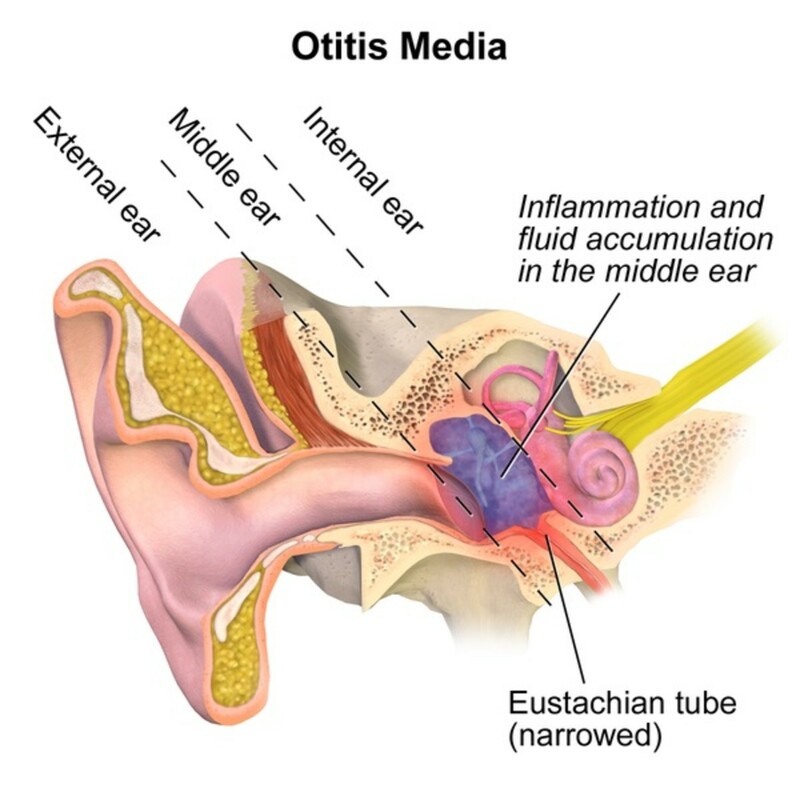 The cause of otitis media is often a problem in the eustachian tube. Infected material from the tube may enter the middle ear, causing inflammation and fluid buildup. The tube normally drains mucus, fluid, and bacteria from the middle ear, but if the tube is infected, inflamed, blocked, or malfunctioning it may not be able to do its job. A collection of mucus and fluid in the ear provides a good medium for the growth of microbes. Acute otitis media (AOM) develops quickly, often when a child has a respiratory infection. Microbes can travel from the throat into the eustachian tube and from there into the middle ear. The child may experience ear pain and hearing loss. He or she may sometimes develop a fever as well. The eardrum may break due to the pressure of fluid buildup, releasing pus. Otitis media with effusion is frequently known as glue ear or OME. It sometimes occurs after AOM but often appears with no obvious cause. In this condition, fluid escapes from blood vessels in the lining of the middle ear ("effusion") and collects in the space around the ossicles. When the eustachian tube is blocked, a partial vacuum develops in the middle ear. It's thought that this vacuum is responsible for the effusion. 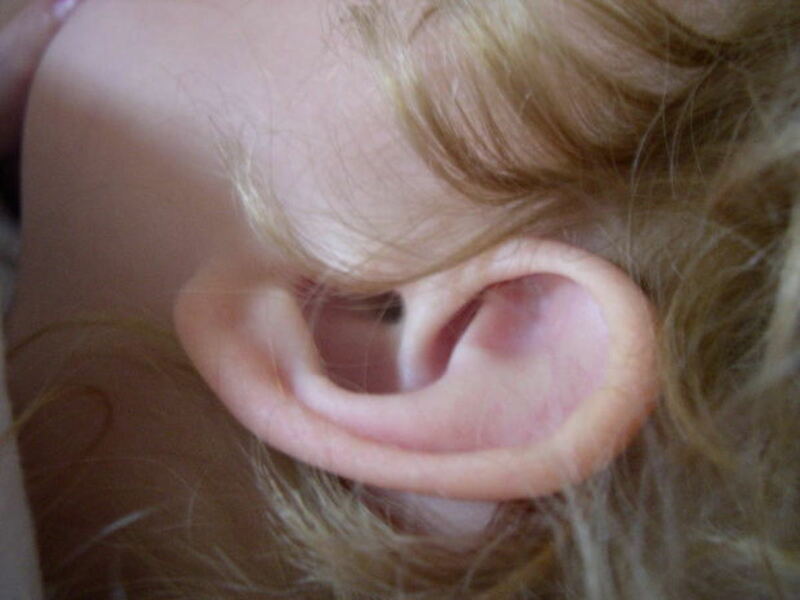 The fluid that collects in someone with glue ear becomes thick and sticky. 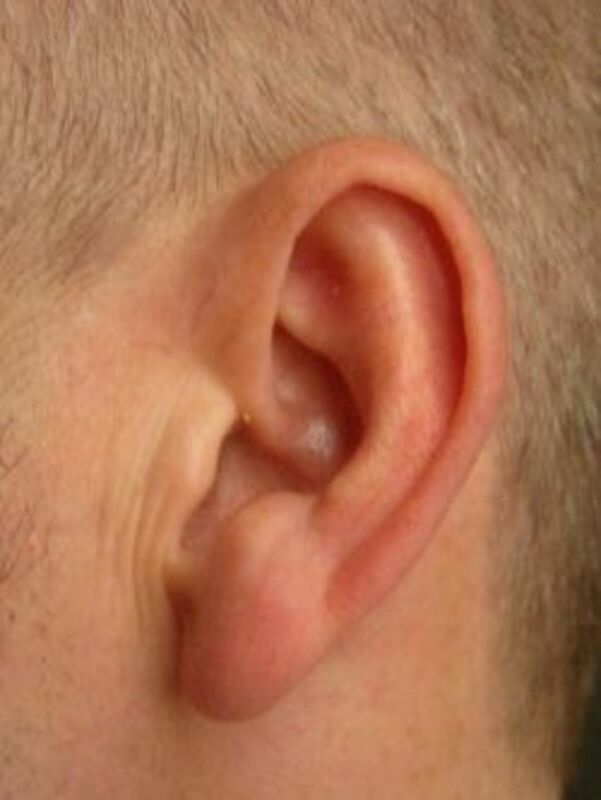 It often creates an uncomfortable sensation of fullness in the ear. It can also cause hearing loss, since the eardrum and ossicles can't vibrate as well when in contact with the thick fluid. A child with otitis media should always visit a doctor. The child's body may be able to fight the infection or remove fluid by itself, but antibiotics and/or pain relievers may be needed. The body may also be able to heal a damaged eardrum on its own, but this process has to be monitored by a doctor. A tube called a grommet, a tympanostomy tube, or a pressure equalization tube is sometimes inserted into the eardrum to remove fluid and to allow air to enter or leave the middle ear as necessary. This procedure doesn't cure a problem in the eustachian tube, but it does improve hearing and relieve discomfort. The process in which the tube is inserted is called a myringotomy. Otitis media is usually treated successfully, Careful attention is needed to notice symptoms of the disorder in very young children, who may not be able to express their feelings very well. Untreated otitis media that continues for a long time can have serious consequences for a child's hearing. Occasionally, an infection in the ear may spread to other parts of the body. Our body often removes the blockage from a eustachian tube and opens a closed one without any extra help, given enough time. There are things that can be done to open the tube quickly, however. Yawning, swallowing, chewing gum, or sucking on a candy can open closed tubes. Taking a deep breath and then exhaling while keeping the mouth closed and pinching the nostrils may also work. The tubes often open with a popping sound. If more help is needed to solve a eustachian tube problem, decongestants can relieve swelling and antihistamines can reduce allergic responses. Sometimes doctors prescribe corticosteroids to reduce inflammation or antibiotics to treat infections. If fluid collects in the middle ear and remains there, a myringotomy may be performed. If self-treatment for a eustachian tube problem doesn't work, it's important to visit a doctor. Eustachian tube problems are usually annoying and unpleasant but not dangerous. They are potentially harmful if they last a long time, occur repeatedly, or are severe, however. In these cases, or in cases where the ears are painful, a doctor's advice should be sought. A doctor should also be visited when children are showing signs that their ears are uncomfortable or if there is any indication that they have a hearing problem. In very young children who can't indicate exactly where their pain is coming from, any symptoms of general discomfort or unusual behavior require a doctor's visit. Can I still go swimming with a blocked eustachian tube? You should ask the doctor or audiologist who is treating you, but I suspect that the answer to your question would be a definite “No”. The increased pressure on the ear during swimming could be dangerous when the eustachian tube is blocked. It may rupture the eardrum and allow bacteria from the water to enter the ear, causing infection. Why is my eardrum not vibrating? I can’t answer this question, since I’m not a doctor. It’s important to visit your physician in person so that he or she can examine your ear, diagnosis the exact problem, and prescribe treatment. Thank you so much for the kind comment, the share and the pin, Peggy! As always, I appreciate your visit and support. This presentation of your about the Eustachian Tubes was as much or more than I learned when studying anatomy and physiology for my nursing. Great job Alicia! You always put so much time and effort into your hubs. Happy to share. Also pinning to my Health board. Thank you very much for the comment, the vote and the share, Rolly! I appreciate them all. Hi AliciaC... this is a hub and a half and such interesting reading... thank you for sharing this with us... voted up and sharing... just awesome. I'm sorry about your ear problems, pstraubie48, but I'm very glad that your new eardrum helped you so much! I can imagine how wonderful it was to hear properly again. I have a hearing problem myself, although it's not due to a middle ear problem. Thank you so much for the comment - I appreciate it! Great hub...well researched and covered. I have had ear issues all of my life. When I was twelve I had a mastoid ectomy. When I was 30 I had a new eardrum made which opened a whole new world of hearing to me. This article is filled with lots of helpful info. Thank you very much, Angela. I appreciate your comment! I recently had some ear issues, and I would have found this very helpful if I had found it sooner. This is a very educated view on the anatomy of the ear and its problems. Great job! Thank you very much for the comment and the vote, Nell! How sad for a child to need several ear surgeries. I hope that her problem was finally solved. Thanks for the comment, teaches. Perhaps your childhood earaches were due to an allergy - it is a possibility! I was lucky as a child - I don't remember experiencing many earaches. You are on your way to writing a set of encyclopedias here! Well done and so interesting to read. I had trouble with earaches as a child, and now I'm wondering if was some type of allergy. Thank you for the comment, b. Malin! I don't like it when my ears are clogged, either - it's an unpleasant situation, especially if my hearing is muffled too! I Hate when my Ears get Clogged...What a Wonderful Hub Alicia, a step by step Educational read into the inner working of the Ear. So Understandable..."I HEAR YOU"! Thank you very much, Martie. I appreciate your lovely comment, and the kind vote as well!! Alicia, what a profound and comprehensive hub about Eustachian tubes and plugged ears. This is the best I've read so far on the topic. Voted up and absolutely awesome! Thank you so much, drbj!!! I appreciate your visit, the kind comment, and the vote very much! Each new detailed and informative hub you publish, Alicia, is even more detailed and informative than the last. Trust me. You are surpassing yourself each time you write. This outstanding aural dissertation is no exception. Brava and Up! Hi, mperrottet. Having an almost continual blockage in an ear because of allergies must be very unpleasant! I hope you find a solution to the problem. Thank you for the comment and the votes. Thank you for the wonderful comment, eHealer! I appreciate it very much. Thank you for the vote, too. Hi, teresapelka. Thank you for the interesting comment. I've never heard of this information. It does sound very strange! It's true that scientists don't know everything about the human body, but like you I don't consider this report to be reliable. Who knows, though - sometimes researchers make new discoveries and realize that what they thought they knew about the body is actually wrong! Very informative hub. I found it interesting because I almost always have the feeling of blockage in one ear because of allergies. Voted up and interesting. I once happened to read in a resource that I did not consider most reliable, however, that the human hearing, normally about 0 - 20 kHz, can 'stretch' the eardrum and make a human hear up to about 30 kHz in conditions of physiological stress. Would you confirm, deny, or have another opinion? Thank you very much for the comment and the votes, JCielo, and thank you for sharing the information about your son's experience with glue ear. I appreciate your visit! My youngest son suffered from glue ear when he was very little. It took a long time to clear up and included grommets and an operation. Wonderfully detailed and informative hub. Voted up and more.